“I’ll have to come back and see him again,” The Doctor said. “Some day I WILL have to come and do the lecture about poetry. They will need their history and culture. Even people setting out on a bright new future need a past.” He sighed as he looked one last time at the Rhekan system and then pressed the switch that sent them hurtling into the time vortex. Then he smiled cheerfully. “Onwards to the next adventure,” he said. “Yes,” Susan agreed with an enthusiastic smile. The Doctor was glad to see that she WAS enthusiastic. He liked having her around. He even liked the music she got the TARDIS to play. Strange that, he thought. Because a lot of the music his own Susan played drove him nuts. He was five hundred years older than when Cliff Richard and the Beatles and the like were blasting out of the console speakers and yet his musical tastes were ‘younger’ than he was then. He still liked serious music, too. Puccini was an old friend, after all, but he found himself singing along with Kurt Cobain and didn’t get the sort of headaches he used to get in his ‘older’ days. They go to a lake of fire and fry. Susan was still trying to work out how exactly you could SWIM in zero gravity. Wouldn’t the water drift away? The Doctor grinned and went to set the co-ordinate. There was a slight change in the engine tempo as the time rotor accepted the new destination. As he stepped back from the console, though, the TARDIS jerked violently. The Doctor grabbed the console with one hand, and with the other grasped Susan firmly, pulling her closer so that she could grasp a handhold for herself. She cried out in fright as they dropped vertically very fast. “What sort of something?” Susan asked as the viewscreen resolved into a starfield somewhere in space. “Doctor?” Susan looked at him and thought she had not seen him look quite so shocked as he did right then. He looked up at the viewscreen as the TARDIS slowly revolved around and his face went pale. Susan looked and she, too, went pale. The expression ‘dead in space’ came to her mind as she looked at the object that filled the viewscreen. And the word DEAD was the all too ominous operative word. The Doctor’s hearts sank. He bit back painful tears as he thought of it. More than once before, when they both faced the challenge of the Rite of Progression, when Nine was trapped in the vampyre den in Flydale, he had fervently wished he could change places with his other self, because Nine, with his children and grandchildren, a whole dynasty that depended on him for so much, had so much more to live for than he did. The patriarch of the New Lords of Time had more of a place in this universe than the Lonely God. But that wasn’t true now. He wasn’t a Lonely God, a homeless wanderer. He, too, had a wife and a son, a future. So he mourned the death of the other half of himself, but this time he had no desire to sacrifice himself to save the other, even if it were not too late. They both stared at the gaping hole in the ‘dead’ TARDIS. A chunk had been blown out of the top right corner of the door, and part of the roof, leaving it open to the vacuum of space. The hole bore signs of burning around the edges as if the TARDIS really WAS made of wood. It really WAS dead. It hung there in the emptiness of space because even a dead TARDIS was a thing that disobeyed the laws of physics as they applied to this universe. Otherwise it would be tumbling away, eventually to be caught up in the gravity of some planet and to burn up in the atmosphere, perhaps falling to the surface as an intriguing meteor with metals in it that would puzzle some research department or other. Or perhaps it would fall into a black hole and be crushed to a singularity. Or it could drift into a nebula and its own weak gravity field would attract rocks and dust and eventually it would become the heart of a new planet. That would be fitting, he thought. A new beginning. New life, perhaps. But right now, it was just dead. And so were its crew. “Is it possible anyone could be alive?” Susan asked, almost as if she had read his thoughts just then. That fire should take him – one of him – in the end – was it ironic, fitting, fate catching up? Fate having a last cruel laugh? He ran back to the environmental control and looked at it closer. It was a human life sign. Not Time Lord, not a half-blood or hybrid or any other species, but a Human. The significance of that pounded in his brain but he pushed it away as he worked to established a safe link between his TARDIS and the stricken one. He couldn’t do what he usually did when he and Nine met up in space, connecting the two doors and simply stepping from one to the other. There was too much damage to the other TARDIS. Instead he made his craft do something it COULD do if it absolutely had to, though it took so much power he didn’t even attempt it often - a gravity bridge – basically extending the TARDIS’s gravity field, the field which prevented decompression when the door was opened in space, into a sort of tunnel that he could use to pass from his TARDIS to the other one. He moved in as close as he dared. About fifteen feet lay between them when he established the link. “I will,” he promised her. Then he turned and went to the door. She came with him to the threshold. When she saw what he was doing, the very THOUGHT of following him fled from her mind. He was WALKING on empty space. There was NOTHING beneath his feet but stars, millions of light years away. He didn’t look at them, she noticed. He just kept walking until he reached the stricken door. She saw him reach out to push open the door. She turned away and went back to the console. She watched him on the lifesigns monitor as a dark blue blip moving towards the pale blue one she had spotted. The gravity extension encompassed the other TARDIS, but he had to close off his lungs and recycle his air as he stepped into the dark console room. He pulled out his sonic screwdriver and used it in penlight mode. It lit a small section of the burnt and blackened console as he stepped up to it. He found the body lying by the environmental control. He knelt by it and he knew straight away what he was looking at. He had died of severe burns and asphyxiation. He had died three times. The first body had succumbed to the heat and smoke and regenerated. The new body had barely had chance to draw breath before he, too, died. The final regeneration had, he supposed, suffered the least. He died, finally, for good. He stood up and walked away from the body. He had been dead for a while. A Human was STILL alive somewhere. He shone the penlight down and spotted the slight movement. He yanked the grilled floor panel up and reached to lift her up from the hiding place. She was wearing an oxygen helmet - the sort he kept on board the TARDIS for when they explored planets that didn’t have oxygen atmospheres. But it worked by extracting what gases there WERE and converting them to oxygen. There was almost nothing left in the TARDIS. The fire that had raged hotly had consumed most of it. She was dying, more slowly, but dying. “I’m sorry,” he whispered in a voice that was harsh and strange because of his recycled air. “Oh my girl, I am so sorry.” He held her in his arms and gave what comfort he could. “Thank you,” he answered and pressed her even closer to him as he heard her last, ragged breath and felt her Human heart stop beating. He carried her to where the other body lay and put her down next to him. Then he turned and walked out of that terrible place. He stumbled blindly across the gravity bridge and through the door to the bright, alive, functioning TARDIS, and into Susan’s arms as she reached for him. He tried not to cry. But he couldn’t help it. His tears forced themselves out as he gasped for air and clung to her, his face pressed against her shoulder, long black hair smelling so clean and fresh, her body warm and alive against his own, her Human heart beating in syncopation to the two hearts in his own chest. “Yes,” he answered her. “Too late.” He drew back from the comforting embrace of a friend. He kissed her cheek gratefully, then he turned to the console. He cancelled the gravity bridge and pressed the automatic door control. Then he moved the TARDIS back away from the dead TARDIS. When he was at least a hundred metres from it he began to type rapidly and with a strange kind of desperation. Susan saw on the viewscreen, something that looked like lightning arc out from their TARDIS and hit the other one. Then the other TARDIS imploded in bright, actinic light. Even from the safe distance they felt the shockwave hit them. Their TARDIS rocked and bucked but was unharmed. “So now.…” He looked at her. He looked away. He closed his eyes and remembered the scorched remnants of a pinstripe suit and white canvas shoes that still hung on that body with an unfamiliar face and what had been ginger hair. “Always wanted to be ginger,” he whispered as he remembered holding Susan in his arms and comforting her in her last moments. “So now.…” he reached into his pocket and found the thing she had given him. It was the TARDIS equivalent of the black box flight recorder. It was the record of what had gone wrong over there. He slotted the memory chip into the console and stood back. He took hold of Susan’s hand, first, then held her by the shoulders, tightly, as the hologram of himself shimmered and steadied itself. The hologram flickered off and the viewscreen flickered on. They both watched as information filled the screen about the disaster that struck the TARDIS. He looked at the data stream on the computer screen that came with the audio visual. He looked up at the real time and date according to the TARDIS clock. He darted around the console again and began initialising the drive. Susan felt the change in the engines as they entered the vortex and began flying back in time and through light years of space. Then the TARDIS dropped out of the vortex violently again. The Doctor reeled back from the console as he felt an electronic jolt and the drive console blew up. He reached for the fire extinguisher and the flames were put out, but he stared disconsolately at the damage. “The conduits are overloading. The risk of an explosion….” The Doctor looked at his console. the TARDIS had been his most faithful friend all his adult life. He had depended on it as a home, as a friend, as an advisor, all that time. It had rarely let him down. Now it was dying and he felt as if he was letting IT down. The TARDIS said nothing in reply, of course. It never did. But he had given himself a clue. The flight recorder. It wasn’t just to warn him of impending doom. It was meant to tell him how to avoid it. “Trust me?” he asked her. “What if….” Susan began. But The Doctor wasn’t listening to her. His attention was drawn to the information on the database and to the disaster unfolding on the viewscreen. “NO,” The Doctor decided. “No, we’re not. We’re going to make it. Susan, hang in there. We’re going to live. We’re going to break the rules AGAIN.” He began pulling wires from under the broken drive console and rerouting them frenetically. Susan ran to do as he asked. Doing something, doing ANYTHING, felt better than doing nothing. She felt less scared now. She knew he was going to do something that would prevent them both dying a horrible death. She didn’t know for sure that it would work, but at least they were BOTH trying. The Doctor looked at her, and smiled gently. The floor shook and the console sparked and flashed. There was an explosion somewhere deep inside the TARDIS. The lights went off and low level emergency lights came on instead. “Yes,” she answered. But she wasn’t so sure now. It WAS frightening. “There!” he said. The viewscreen flickered as the emergency power started to drain, but the TARDIS was there. The earlier version of this one. Five minutes earlier than when they had dropped out of the vortex and found the first stricken TARDIS, five minutes before the systems went critical and it was too late for them both. 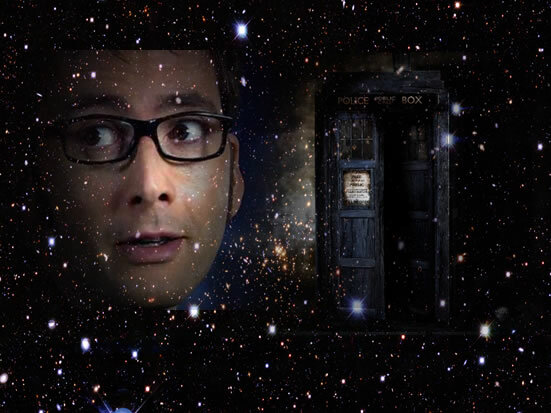 He felt the gravity field extending around his TARDIS. His earlier self had been sensible enough not to try to connect the two capsules, seeing as this one was minutes away from a fatal explosion, but he had established a gravity bridge. She kept her eyes open and she kept them on the other TARDIS. The door was opening. She could see the familiar warm orange ceiling lights and the glow of the console. She felt something beneath her feet as she ran alongside The Doctor, but she didn’t WANT to know what it was. They reached the TARDIS. The Doctor slammed the door behind him and ran up to the top of the ramp before he stopped and looked at the earlier versions of himself and Susan. HE was handling things philosophically. Susan looked scared to death. 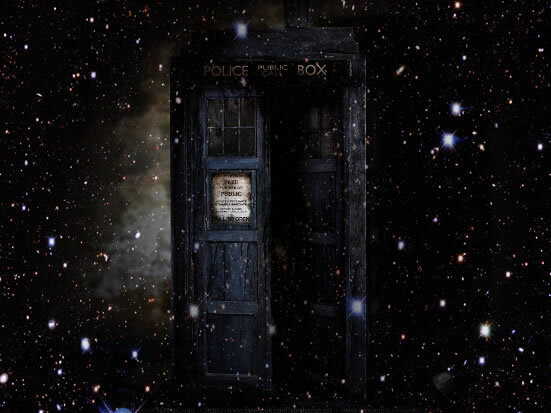 On the viewscreen the other TARDIS shook as the explosion ripped a chunk out of the door. The other Doctor reached to break the bridge between the two TARDISes. The two Doctors ran, one slightly ahead of the other, into the depths of the TARDIS. Susan looked at the other Susan. They both began to speak to each other then stopped, then tried again. They both looked at the viewscreen, at the now completely dead TARDIS, and no further explanations were necessary. “You’d better sit down,” Susan told herself, nodding towards the sofa. She went to the command chair by the console. They stared at each other. Still neither was sure what to say. “Sure. Ok.” Susan looked up at the viewscreen. The other TARDIS was gone. She looked around. The other Susan, the one that had come from the damaged TARDIS, had vanished. The Doctor ran into the console room. Just one of him. “She disappeared,” Susan told him. “Oh.” Susan looked at him and shivered as she realised just how big a disaster they had narrowly missed. She remembered what the other version of her had told her and repeated it.